Slovenia was the first ex-Yugoslav republic to join the EU, during the bloc’s big bang enlargement in 2004. This was endorsed in a double referendum on EU and NATO membership, with 89.6% and 66% support, respectively. Unlike Croatia and Bosnia, the small Alpine country escaped Yugoslavia’s bloody disintegration unscathed, after a 10-day war of independence in 1991. It was also able to preserve and grow its communist-era economy, so it quickly became a model for other former communist states of Eastern Europe. Slovenia’s EU membership in 2004 was all the more remarkable as it signed its European Association Agreement only in 1999 (due to a bilateral conflict with Italy), while the other Central- and Eastern European countries had theirs already signed in 1995. Slovenia continued to enhance its reputation by becoming the first of the new member states to adopt the euro, already in 2007. In the same year, it also acceded to the Schengen area. Unlike many other ex-communist countries, Slovenia did not privatise most of the state-owned companies and banks. The population is some two million people, or about 0.5% of all EU citizens (without the UK). However, Slovenia will send double that share (1.1%) of members of European Parliament (8) in this year’s European Parliament elections. Turnout in the last EP election was comparable to neighbouring Croatia’s, with just 24.6% of people voting, well below the EU average of 42.6%. Most Slovenians consider EU membership a good thing (56%) rather than a bad thing (11%), which is slightly below the EU average (62/11). A quarter regard it as neither good or bad. However, Slovenians are the most positive about the euro and the monetary union, which is supported by a high 86%. After growing faster than most of its East European peers for two decades, Slovenia’s economy hit a brick wall in 2012-13, when a banking crisis caused by bad loans almost forced Slovenia to become the sixth eurozone country in need of a bailout. The government eventually avoided the bailout but committed – in talks with the Commission, ECB and the IMF – to create a ‘bad bank’ for non-performing loans, sell many state-owned companies and cut public sector salaries. Since then, the economy has prospered in recent years, though it is expected to slow down according to the EC’s latest autumn and winter forecasts. Between 2014-2018, Slovenia’s economy grew 3.5% on average annually (real GDP), well above the EU average (2.1%). While economic growth is expected to slow to 3.1% in 2019 and 2.8% in 2020, this is still way above the EU average of 1.5% and 1.7% respectively. Total GDP was about €43 billion in 2017 or 0.33% of the total EU27 GDP (without UK). It’s per capita real GDP was €20,200 in 2018, below the EU average of 28,200. Nonetheless, it’s the highest of all Central and Eastern European states that joined in 2004, and also higher than in Portugal and Greece. In purchasing power standards (PPS), Slovenia’s per capita GDP was 85% of the EU28 average in 2017. The unemployment rate was just 5.4% in 2018, well below the EU28 average of 7% (2018). It is forecast to drop further to 5%, coming close to levels reached before 2009. Likewise, Slovenia’s youth unemployment figures, at 9.7% in 2018, are also below the EU average of 15.6%. Slovenia’s political system is grounded in its 1991 constitution, which founded a parliamentary republic with a so-called ‘‘incomplete’’ bicameral parliament, as the upper chamber has much more authority. The prime minister is the most important political figure, who shares power with the president. Slovenia’s political arena has been fragmented since the country became independent, with no consistently dominant political parties, particularly after the retirement of the first post-communist president, Milan Kučan, and the death of former prime minister Janez Drnovšek. Many parties that emerged in the 1990s have since declined, including Drnovšek’s once strong centrist LDS (1994-2011), and the notable Christian Democrat SKD and SLS parties (1990-2014). The Social Democrats have remained relevant but their support has been slowly but steadily sliding. The creation of new parties and party split-offs is quite common. One party that has survived the 1990s and is currently the biggest in the national parliament is the Slovenian Democrat Party (SDS), a former centrist party that has turned very right-wing under two-time prime minister Janez Janša. Janša was one of the main protagonists of Slovenia’s independence, serving as defence minister from 1990-1994. He led the government as the country joined the eurozone in 2007 and held its first EU presidency in 2008. Towards the end of his first term in office, Slovenia blocked neighbouring Croatia’s EU accession talks for a year in 2008-2009 because of a land and sea border dispute. It lifted its veto after the two sides agreed in 2009 to resort to international arbitration, whose results Croatia then refused to accept, quoting irregularities of the procedure. Janša’s second government in 2012 lasted barely a year and was ousted in a no-confidence motion, just as the country’s banking crisis was in full swing. After that, Janša’s political views gradually shifted to the right, he adopted hardline anti-immigration rhetoric and cosied up to Hungary’s Viktor Orbán. 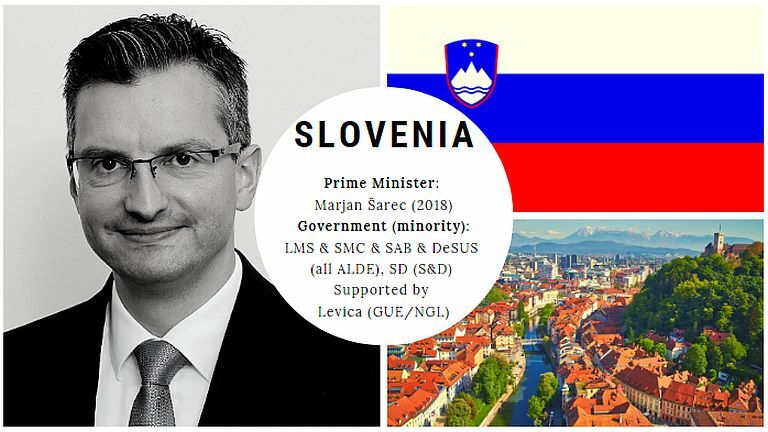 His SDS came out the single strongest party in 2018’s parliamentary elections, but was unable to find a coalition partner and stepped aside, allowing political novice Marjan Šarec and his social-liberal LMS to form a broad coalition of five centre-left parties. Analysts say the Šarec government could be plagued by internal conflicts and unlikely to implement major reforms. Šarec is a former actor and small-town mayor. A year before becoming prime minister, he almost won the presidential election, losing in the second round to incumbent Borut Pahor. His government still has to tackle issues like the sale of the biggest local bank, NLB, and the overhaul of the national health and pension systems. Recent polls suggest a significant shift. Though the populist right-wing SDS had long been leading in the polls, Prime Minister Šarec’s centrist LMS has overtaken it and now heads the polls with around 29%. This could translate in either three or four MEP seats (out of the total eight) for the Alliance of Liberals and Democrats for Europe (ALDE). SDS is set to gain ‘‘just’’ 18.2% of the vote, down from the 28-29% it was polling earlier. This would give it two MEP seats for the European People’s Party (EPP). However, Janša stated he was ready to join a new group with Orbán if the latter were expelled from the EPP. Other parties expected to win an MEP seat are the social democrat SD (9.9%) and left-wing Levica (7.8%). These will go to the Progressive Alliance of Socialists and Democrats (S&D) and European United Left–Nordic Green Left (GUE/NGL), respectively. Moreover, the Christian democrat NSi also has a chance to gain a seat for the EPP. Though these numbers could shift easily, given the precariousness of the local political scene and the low turnout in the previous European election, the trend does confirm that the prime minister’s LMS party has taken over votes from former liberal/centrist parties. While SDS is falling in the polls, its rebound is not excluded. A win or a strong result for the SDS would be an important indicator of whether Jansa’s strategy of turning the once moderate centre-right party into a populist right-wing force is successful, in which case he would remain a threat to the current ruling coalition. Zoran Radosavljevic is the managing editor of Euractiv.